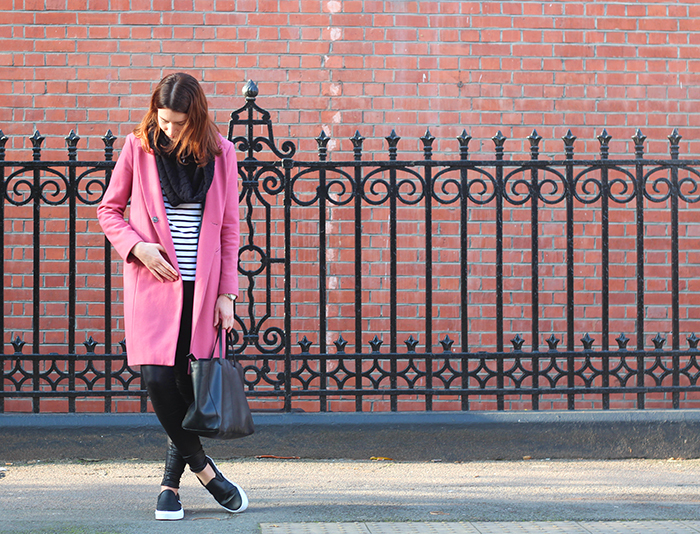 What to wear when you clock off for the week? Dressing for downtime isn't easy - anything tailored looks too corporate and unless you're heading to the gym, a tracksuit looks too Kanye West. My weekend wardrobe has been in need of some serious love of late; so last month I splashed out (oops) and invested in some casual essentials - my first pair of Vans, a pair of felt Converse high-tops and a new Saint James breton tee from Atterley Road. On Sunday my Vans and St James breton tee went on their first outing round London Bridge on a beautiful sunny morning, so my boyfriend shot these pictures for me outside the red-brick Guinness Trust Buildings. 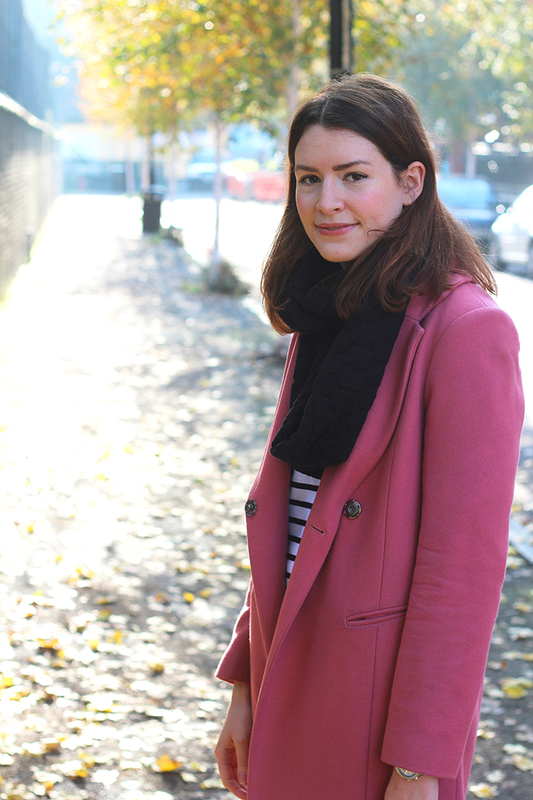 I paired my new purchases with my trusty ASOS faux-leather leggings [I'm 5'10 so the long length are perfect for me] and past season Topshop pink wool coat [my best sale buy ever - £40 in the post-Christmas sales in 2012] for a comfortable weekend look. 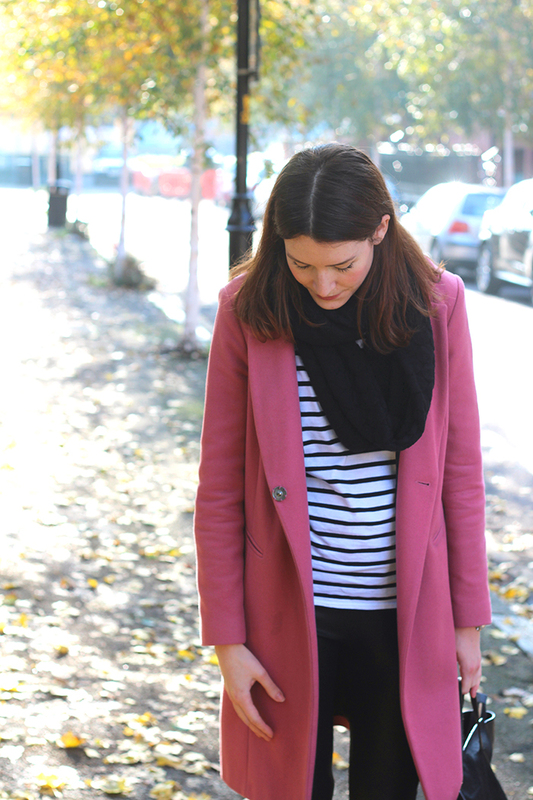 My coat may be past season, but there's no shortage of pink outwear knocking about this A/W if you're in the market for some candy-colour. 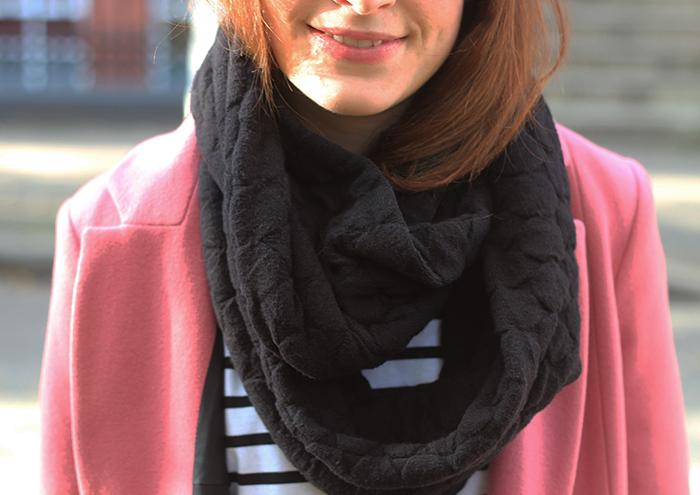 My snood is newly acquired too, it's from The Fold where I now work as Marketing Manager. I may sound biased, but I haven't taken it off since I got my hands on it, it's made from a luxurious, heavy knit that keeps me incredibly warm, and I love being warm! 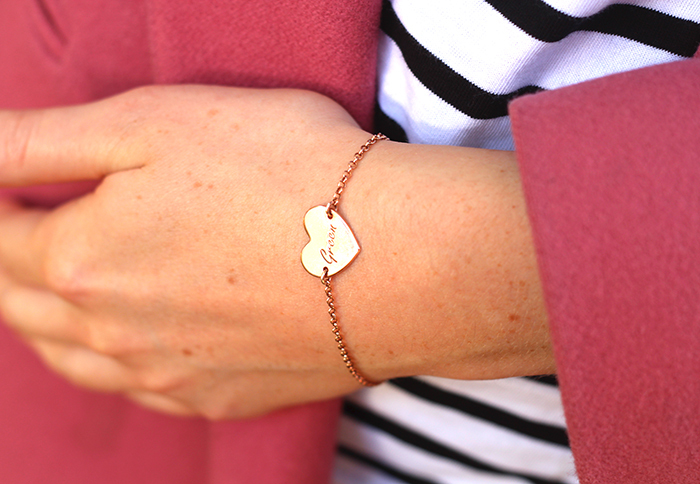 I love a delicate piece of fine jewellery, so I accessorised the look with my pretty rose gold bespoke engraved bracelet from Anna Lou of London. I had mine engraved with my family name and I love it! What are your go-to weekend essentials? Ebisu snood - The Fold. Rose gold engraved heart bracelet - Anna Lou of London c/o. 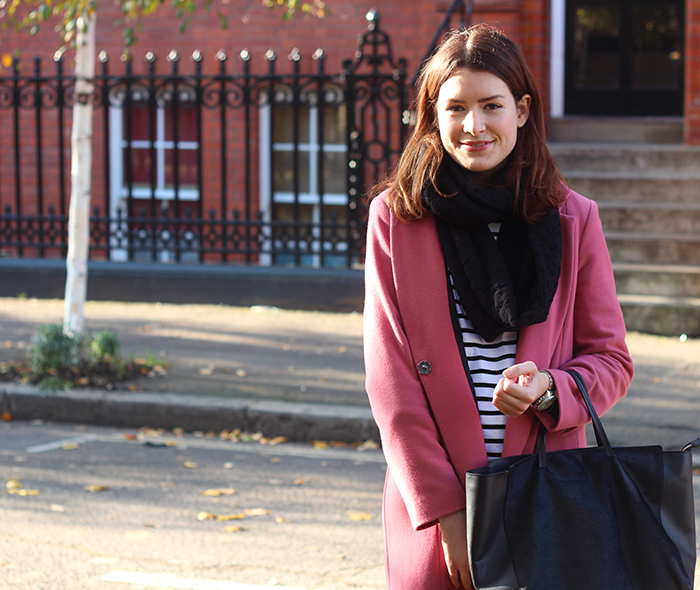 Pink coat - past season Topshop. Saint James breton tee - Atterley Road. Black perforated leather skate shoes - Vans. Ponyhair bag - sold out ASOS. Faux leather leggings - ASOS.